Back at the beginning of February I made a speculation about the Demon basically ending up as three trim levels. 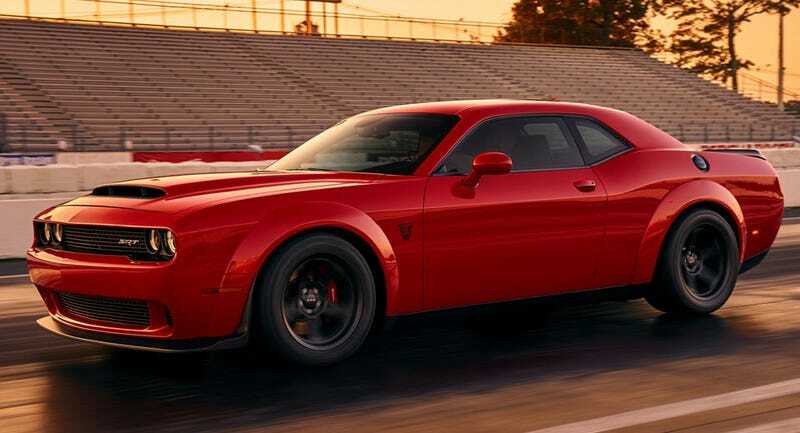 In a nutshell I still think there will be a starting spec that functions as a 757 hp Hellcat update with an 11.21 second quarter mile and the same 275 tires. Then there will be something above that which can knock on a 10.5 second quarter mile. Lastily, a limited production version based around that crate which will do a 9.6 second quartermile in order to grab the crown as the fastest “stock” consumer production car history. I still think all the numbers and teasers have been for the upgraded Hellcat and the Demon but all the hype building is for the crate-built ADR conversions which haven’t been teased and will never been seen on the streets. I’m banking on the number of available crates being the same as the ADR’s horsepower figure. I think it’s all Dodge bending the rules of legality (which will make this a huge collector item for those fortunate 1,000 or so owners). You lot have any speculations before everything is revealed? I never figured out any of the teaser mathy-lookin’ formulas since I thought they would be a wild goose chase after that AWD torque-per-wheel covalent-asymetrical-air-pressure smartypants stuff the first one led to. I don’t care how wrong I end up being, when I speculate I hold onto my bid until I’m completely and embarassingly proven wrong. Same way I play the Price Right, Family Feud, and Tic-Tac-Toe.